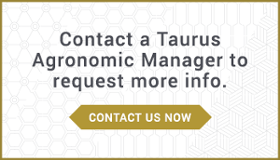 You know K is one of the essential macronutrients required for successful plant growth: but do you know the role of potassium in crop production? Make that roles, because potassium is responsible for many key plant functions. How K affects overall plant health and crop quality. Next to nitrogen, plants absorb potassium in greater quantity than any other nutrient. 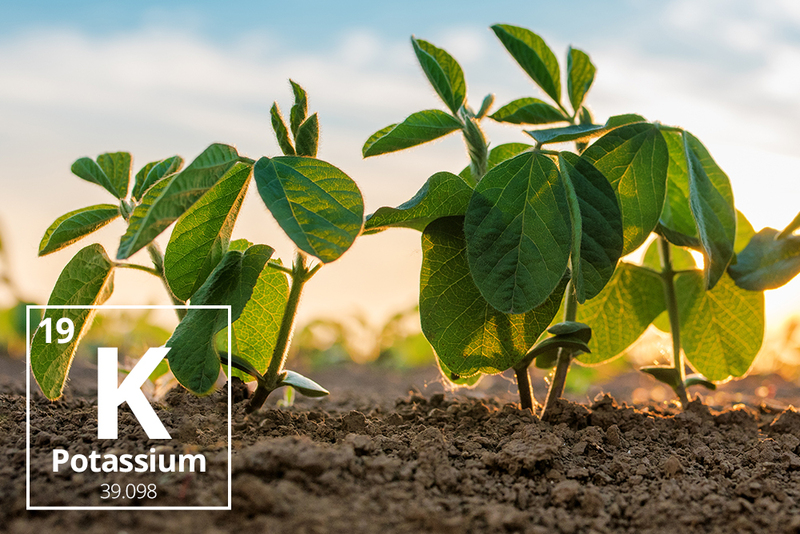 Before we get into the specifics of plant biology and impacts of K at a cellular level, let’s take a look at the importance of potassium in crop production in general terms. Source: Potassium Nutrition in Plants, Fact Sheet. A&L Canada Laboratories Inc. If a crop is deficient in potassium, there will be a noticeable impact on yield potential and crop quality. This becomes evident as we look at the role potassium plays within the plant. Enzymes are required to facilitate complex chemical reactions within the plant. Without potassium, many of these reactions could not occur. In fact, 60 enzyme systems are activated by potassium. This includes enzymes responsible for the production of proteins and starch. It is also vital to the production of adenosine triphosphate (ATP), which is essential to photosynthesis. Potassium activates these enzymes by physically changing the shape of the enzyme molecule – exposing chemical sites that allows chemical reactions to occur. At the same time, it helps maintain an optimal pH level (7 – 8), which is necessary for these reactions to occur. Next, potassium regulates the rate of photosynthesis in plants. The sun’s energy converts CO2 and water within the plant to sugars and ATP, which provides the energy necessary for many reactions within the plant. The movement of sugars in the phloem requires energy in the form of ATP. Without K, the ATP will not do its job – allowing these sugars to build up in the leaves. Sugars are thus withheld from reaching other key parts of the plant. A lack of K will impair the rate of photosynthesis and impede growth and development. Moving water, nutrients and carbohydrates. Potassium is central to the transportation of water and nutrients within the plant’s xylem. Ample supplies of potassium improve the plant’s ability to translocate nutrients and amino acids. Synthesis of proteins and starches. Nearly every stage of protein synthesis (involving duplication of the genetic code into RNA) requires potassium. K is also required to activate starch production (which is the key to achieving high grain quality). 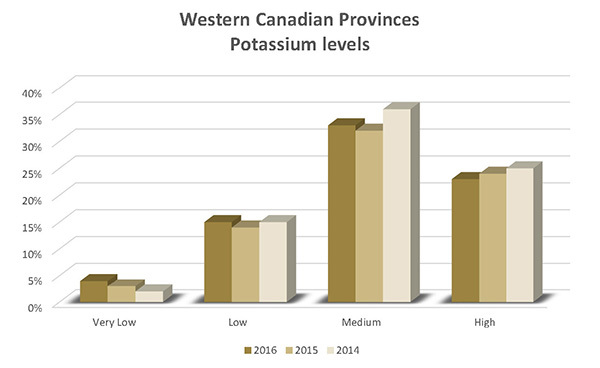 Data compiled by A&L Canada Laboratories over a three-year period indicates that the majority of soil samples from western Canada tested in the midrange for potassium (see chart below). Signs of deficiency can vary from crop to crop. Generally, there is a yellowing (scorching) along the margin of the leaves. It starts with the older leaves at the bottom of the plant, progressing to newer leaves as the deficiency progresses. In soybean crops, the leaves will often shed prematurely. Because the root systems of deficient plants are underdeveloped, this can weaken the stalks – resulting in lodging in cereal and corn crops. Potassium is the seventh most abundant element on earth. It makes up 2.5% of the earth’s crust. 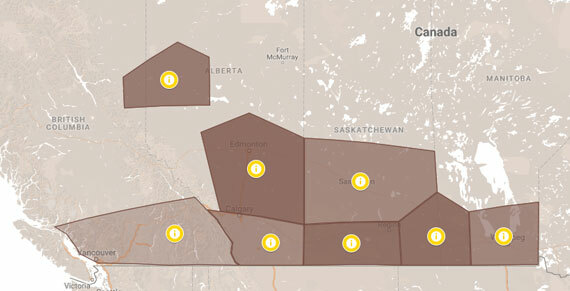 Canada is the world’s largest producer and exporter of potash (The Canadian Encyclopedia) followed by Russia. In the next part in this series, we will look at how K is available in the soil and how it interacts with other nutrients. Functions of Potassium In Plants. Better Crops/Vol. 82, No. 3. 1998.